Brock Holt drove in five runs and the Boston bullpen bailed starter Joe Kelly out with six shutout innings as the Red Sox came from behind to beat the Blue Jays 8-7 at Rogers Centre in Toronto. Toronto took an early 1-0 lead in the bottom of the first on a sacrifice fly by Edwin Encarnacion. 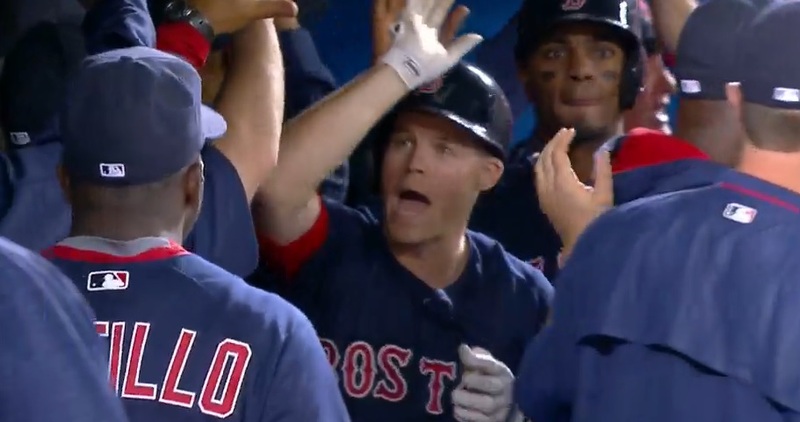 The Red Sox tied the game in the top of the second on an RBI double by Holt and briefly took the lead in the third on an RBI double by David Ortiz. Joe Kelly coughed up a grand slam to Josh Donaldson in the fourth, part of a 6-run inning that knocked Kelly out of the game and gave the Blue Jays a 7-2 lead. 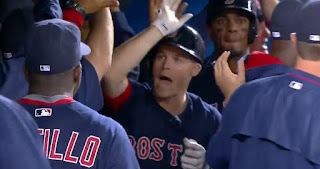 Holt (pictured) narrowed the lead to 7-6 with a grand slam of his own in the sixth and Boston took an 8-7 lead with a pair of runs in the seventh on RBI singles by Ortiz and Hanley Ramirez. The Red Sox pounded out 11 hits. Xander Bogaerts led the team with three; Ortiz, Ramirez and Holt each had a pair. The Boston bullpen of Noe Ramirez, Matt Barnes, Junichi Tazawa, Koji Uehara and Craig Kimbrel combined to shut down the Toronto offense.